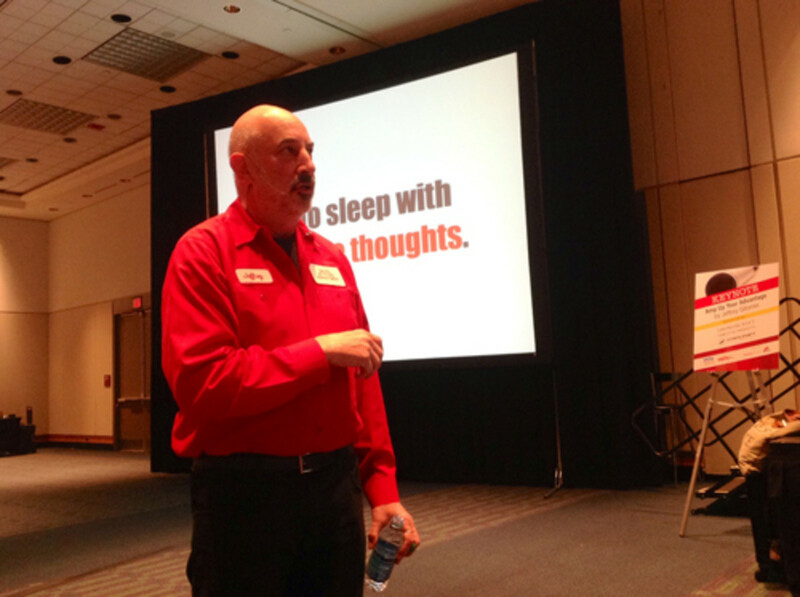 Noted business guru Jeffrey Gitomer delivers his keynote address Monday at the Marine Dealer Conference & Expo. ORLANDO, Fla. — More than 200 people packed a hall at the Orange County Convention Center on Monday for noted business guru Jeffrey Gitomer&apos;s keynote address at the Marine Dealer Conference & Expo. Gitomer came to the dealer conference with a prime business pedigree as the author of 11 best-selling business books. He has consulted for companies such as Coca-Cola, BMW and IBM. Those unfamiliar with his lectures quickly discovered that he also comes with a wicked sense of humor. Riffing on the government shutdown, poor airline service, boat salesman cliche lines — even his failed marriages — Gitomer&apos;s rapid-fire delivery mixed laughs with insight about sales and customer service. "I fly US Airways," he told the crowd. "Their motto is, &apos;We’re not satisfied until you&apos;re not satisfied.’ "
The dumbest question in sales: "What&apos;s it going to take to get your business?," he said. "Why don&apos;t you just ask, &apos;How much do I have to cut my price to get your business?&apos; "
Gitomer blended blunt honesty with his humor. Mocking AOL and Blackberry for bleeding tens of millions of customers, he said the companies had only themselves to blame. "Lousy service and low technology: Keep that in mind if you want to keep your customers because it’s a new world," he said. Gitomer talked about how technology is changing the business world and how companies that refuse to adapt will be left behind. Maintaining an online and social media presence is critical to long-term success, regardless of a company&apos;s size. "How many of you have never tweeted?" he asked, prompting numerous hands to rise. "I&apos;ll guess your technology is probably 10 years behind the curve since Twitter is 10 years old. What are you waiting for? It&apos;s all free." Gitomer&apos;s main focus was how to sell and how not to sell. "People don&apos;t like to be sold, but they love to buy," he said, adding, "People buy for their reasons, not yours. So find out theirs and sell them on it." Gitomer spoke about asking questions such as "What was your first boating experience like?" as a means of forging an emotional connection. A positive attitude, belief in company, product and self, honesty, sincerity and friendliness remain universally powerful sales tools, he said. "Trust is built slowly, over time," he said. "You can&apos;t do it in a day, but you can lose it in a second." Gitomer cautioned against prejudging potential customers in today&apos;s world and reminded the audience that today "your customers are smarter now than they&apos;ve ever been before." In the end, he said, the goal is not a satisfied customer, but a loyal one. "Relationship trumps price," he said.